'Earth to Echo': Could Extraterrestrial Life Be Cute? 'Earth to Echo' movie poster. The new film "Earth to Echo" — which follows a group of kids on a fictional journey to help save a small alien robot — might have a bit of extraterrestrial truth at its core, one alien-hunting astronomer says. As it turns out, writer Henry Gayden's ("Zombie Roadkill," the upcoming "Children of the Lamp") depiction of a small, owl-like alien robot might be a more likely candidate for first contact than most people would expect, said Seth Shostak, a senior astronomer at the SETI Institute in Mountain View, California. Given the dynamics of interstellar travel, robots make sense, he said. 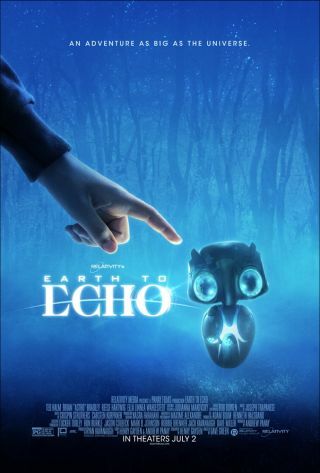 Star Teo Halm encounters Echo, a small alien who has become stranded on Earth in Relativity Media´s "Earth to Echo." Cybernetic brains seem to be the way to go when traversing the huge distances between stars, Shostak added. "Machines have a lot of advantages over soft, squishy protoplasmic intelligence," Shostak said. "They can evolve much more quickly. Machines are not stuck with Darwin." In his role with SETI, Shostak not only oversees much of the science underpinning the sprawling project, but also spends a lot of time pondering the implications. "I think it's a safe bet that if we find extraterrestrial intelligence, it's more likely to be machine intelligence than biological. That makes sense." Given the distances and physics involved in traveling vast distances across space, Shostak thinks that extraterrestrial visitors are likely to be both artificial and small. "Most people think of aliens as being human-sized — that if you have too small a brain, you are not smart," Shostak said. "That's all based on Earthly biology, which is based on neurons. Neurons of all species are about the same size." "If I were creating an artificial intelligence," he continued, "I'd want to save on the rocket fuel and make the intelligence small — not so small that it gets wiped out by the first raindrop it encounters, but you don't want to send elephants into space, either. So if you can build smart things that are small, it makes sense to do so. Of course, smaller is also cuter." Director Dave Green, Reese Hartwig, Brian "Astro" Bradley, Ella Linnea Wahlestedt and Teo Halm attend as Relativity Media presents the world premiere of "Earth To Echo" during The LA Film Festival at Regal Cinemas L.A. Live in Los Angeles, CA on Saturday, June 14, 2014. While the last statement has a humorous bent, animal researchers have suggested that the eye size and spacing of baby mammals are traits that evolved, in part, to make them cute, because cute animals are more likely to be nurtured by their parents and, therefore, survive. And make no mistake — the small, owl-shaped robot in "Earth to Echo" is, indeed, ridiculously cute. The practical and computer-generated effects were engineered by a team led by effects pro Alan Scott, whose credits include Steven Spielberg's "A.I." and "War of the Worlds." But the actual design for the diminutive extraterrestrial came from another source. Director David Green had sent out requests for a preliminary design for the alien robot to the usual suspects in effects-driven Hollywood, and the results were "across the map," he said. "Some were really scary," Green added. "Some of them were very abstract." But none made him care for the little robot, which is arguably the star of the film. Green queried his network of friends both inside and outside Hollywood, and was eventually led to 19-year-old visual designer Ross Tran, who was home with his parents in Los Angeles between semesters at college. When he understood what they were looking for, he came up with some drawings in a few days. Of course, cuteness appeals to not just the audience, but the film's protagonists as well. When asked about the storyline of kids finding aliens, a device with a long history in Hollywood, Shostak reflected on whether an alien stuck in Echo's situation might do better being found by kids than adults. "I think that kids are good because they won't try to take advantage of you," he said. But what if it's not kids who find the alien? Or, in the case of "Earth to Echo," what if the alien is pursued by "the government," as so often happens in these films? What would the government's agenda be? Shostak said there is, to his knowledge, no preset plan for dealing with an extraterrestrial presence on Earth. Shostak said that about a third of the population of the United States believes not only in extraterrestrial intelligence, but that these beings are already here. In his job at SETI, Shostak talks with these folks every day, sometimes a dozen or more of them. It can be taxing, he admitted. But Shostak said he doesn't know when first contact would occur. "We really don't know — we can only guess," Shostak said. "What we do know, what we have only garnered in the past few years — thanks to the Kepler mission — [is] that one in five stars up there might have a planet somewhat like Earth. "So, in our galaxy alone, we have 50 [billion] to 80 billion star systems like our Earth's, and we can see 150 billion other galaxies," he continued. "You multiply those together, and you get a number that you can't pronounce, that is really big. Maybe most of those planets are sterile and not very interesting, but some will be interesting. If you buy quadrillions of lottery tickets, most may be losers but not all of them." So, the odds would appear to be in favor of eventually meeting something from beyond Earth, according to Shostak. Here's hoping that it will be as adorable, and as friendly, as Echo. "Earth to Echo" opens in the United States on July 2.